Reduce cycle time by demoulding at the right degree-of-cure independently of the mould temperature. 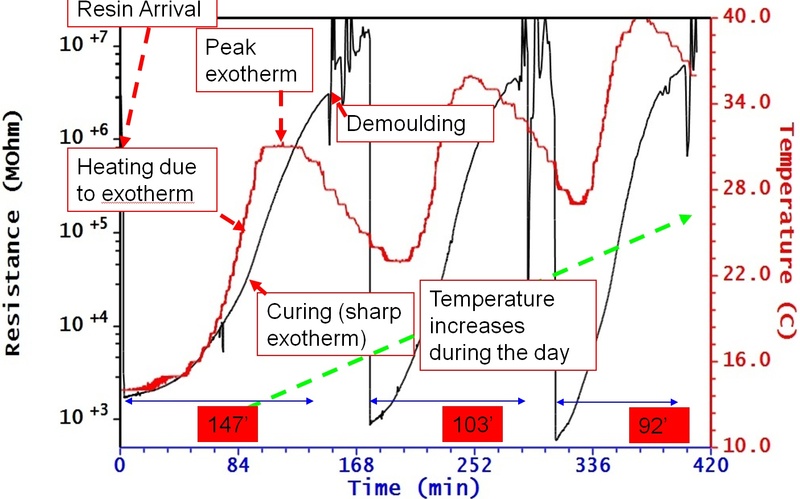 In the figure below a typical continuous LightRTM serial production was recorded (electrical resistance and temperature) showing the potential of demoulding according to the measurements and not at a constant cycle time for a non-heated tool case taking advantage of the self-heating of the composite mould from the exotherm of the part. So according to the graph in just 3 cycles demoulding time decreased 35%. Using the Optiflow system a cheaper version, with respect to Optimold. of cure monitoring is possible. With Optiflow there is a possibility to monitor 4 different moulds simultaneously and decide about the opening time based on the measured temperature. You can watch a video from a demo of the control system on a serial LightRTM production below (©Karnic Powerboats, demonstration video created for the iREMO EC-funded project Contract Nr CP-FP 228662-2).